Anyone who knows my kids also knows that they love to eat! If you follow us on Instagram or SnapChat you’d see numerous clips of my girls eating. Why is that? Because they just love food and I just love letting those little palettes of theirs explore different foods and flavors! Watching my children eat and enjoy different foods excite me. I love seeing their reactions: head nods, scrunch faces, sour faces, spicy faces – you get it. My family loves to eat, we love to eat different things, and we explore different cultures through food. Variety is key in feeding my littles! We rarely have to think about bringing breakfasts, lunches, and dinners for these girls when we go out, thanks to baby-led weaning. However, when we do go out on family hikes, park/beach dates, or anywhere that food isn’t readily available we like to make sure to bring food with us. As I’ve mentioned before, I love using stainless steel products and food containers are no exception. 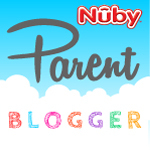 We have and use several brands (all which I am very happy with), however when I had the chance to try out the Nuby version I was very pleased with the special features that the other ones don’t come with. We’ve actually been using this jar quite a lot lately with our trips to the beach, hiking and Disneyland, so I can actually tell you from past experiences that like almost all of these products (cups and jars) they are actually a bit temperature sensitive. So be careful opening after trekking up high altitudes or leaving it in the car during a hot sunny day. A pop sound might occur after opening but don’t be alarmed, nothing to worry about. First off, as with the others, this food jar is made of dual wall insulated stainless steel to keep warm foods warm while still having an exterior that stays cool to the touch (so no random sweat beads dripping into your bag). One impressive special feature is the separate compartments for this food jar. It included two separate compartments the large part for liquids or wet foods and a small hidden compartment for dry foods (perfect for snacks or treats). I especially like that above this small compartment is the mini tray that fits and includes a foldable spoon for easy feeding on the go! The tray sits above the small compartment and this actually makes for hiding those yummy treats from your little a cinch, until they finish all their food in the jar first. Lucky for you, this food jar is currently on sale at Babies R Us as part of their Mega-licious Mealtime SALE (3/1/16 – 3/31/16). Visit Babies R Us stores to view Nuby’s full assortment of feeding products & SAVE BIG! Also be sure to check out the FREE Mega-licious Mealtime Event on March 12th at ALL Babies R Us stores! I did not receive any compensation for this post, although as part of this program I received items to sample or review. As always, all opinions are my own and 100% honest.